The University of Arizona College of Medicine – Phoenix will welcome a Fulbright Scholar to campus this fall, whose mission is to better understand the neurology and genetics in people affected by cerebral palsy. Renowned physician-scientist Michael Fahey, MD, an associate professor at Monash University’s School of Clinical Sciences at Monash Health and head of the Paediatric Neurology Unit at Monash Children’s Hospital in Melbourne, Australia, was awarded a prestigious Fulbright Scholarship to spend three months in the U.S., where he will work with Michael Kruer, MD, an associate professor of neurology and child health at the UA Phoenix medical school. Dr. Fahey, who will be in the U.S. for three months beginning in November, will spend most of his time in Phoenix, but expects to travel to other health centers to build collaborations centered around cerebral palsy genomics. The flagship foreign exchange scholarship program of the U.S., the Fulbright Program increases binational research collaboration and the exchange of ideas. 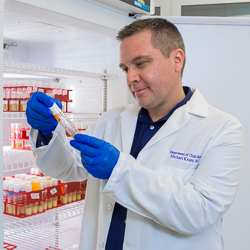 The scholarship will enable Dr. Fahey to characterize the genetic changes that lead to CP. Dr. Fahey will work in Dr. Kruer’s laboratory at the UA College of Medicine – Phoenix integrating phenomic, genomic and model organism data. He also will see patients with genetic forms of CP at Phoenix Children’s Hospital with Dr. Kruer, who is director of the Cerebral Palsy and Pediatric Movement Disorders Program at Barrow Neurological Institute at Phoenix Children’s Hospital. Cerebral palsy is the most common disability in childhood collectively, affecting more than one million Americans and Australians. Recent studies indicate that about 30 percent of people who have CP have a genetic contribution to their condition. Thanks to the Fulbright Scholarship, Dr. Fahey will work with Dr. Kruer to combine world-leading neuroimaging data from the Australian Commonwealth Scientific and Industrial Research Organization with contemporary genomic techniques to better understand complex neurological diseases.